Delta is another word for difference. The difference between what you earn and what you spend, the delta, is what is left to save and build wealth. In America in 2013, the median household income was roughly $51,000, with an average savings rate of 3.9%, roughly $2,000, meaning the median American family spent $49,000. We will use these numbers to show the importance of increasing delta to build wealth. $2,000 per year invested at 8% per year for 30 years will result in $244,700. Not bad, but also not enough for a comfortable retirement. What if our average family earned 10% more and spent 10% less? Both of these are possible for most people. Working extra shifts, making some side money, or asking for a raise can all result in a 10% bump. Eating out less, packing work lunches, skipping Starbucks, cutting cable, shopping around for insurance, etc can result in these type of cuts. The new numbers would be $56,100 income and $44,100 in expenses. Now this family has a delta of $12,000, a savings rate of 21.4%. A 10% cut in expense and a 10% increase in income results in a 600% increase in savings, for the median family. $12,000 a year for 30 years will result in $1,467,000. More important than the result of compounding the savings over time is that knowing you have this margin in life, allows for much less stress. In our culture we tend to increase our lifestyle with every increase in pay, leaving us living paycheck to paycheck for our entire working careers. It doesn’t have to be this way. Even if 10% isn’t possible in your current situation, smaller changes make a big difference too. 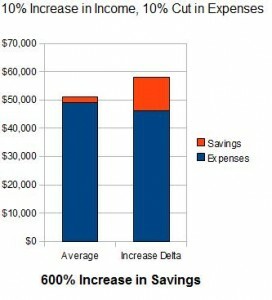 Even at 5%, income would be $53,550 and expense would be $46,550, Resulting in a $7,000 delta, a savings rate of 13%. Increasing the delta in your budget is the #1 way to build wealth. It really doesn’t matter what you make, the only real metric is what you keep. Recently I signed up for Personal Capital , a free program that groups all of your accounts together. With Personal Capital it is easy to track your income and expenses over time to make sure you have a clear vision of where your delta is now and how you are doing over time. 6 Responses to "Budgeting: Maximize Delta to Build Wealth"
“It really doesn’t matter what you make, the only real metric is what you keep.” – BAM! The graph really illustrates your point: small changes to income and spending, huge change in saving. I find making graphs helps to see the change better than just posting the numbers (and they are fun to make too), thanks for stopping by! Completely agree, I love graphs too. Look forward to reading more on your blog. Nice explanation. There is too much focus on maximizing returns in the literature and not enough about how much of your income you use to invest for the future in the first place. Single-digit savings rates seem to be “normal” aka acceptable. We chase return percentages when the savings rate is what will “save” us in the end. Well Said! “normal” is no fun! We have a limited amount of control over what returns we earn, but we have 100% control over how much we save and invest.